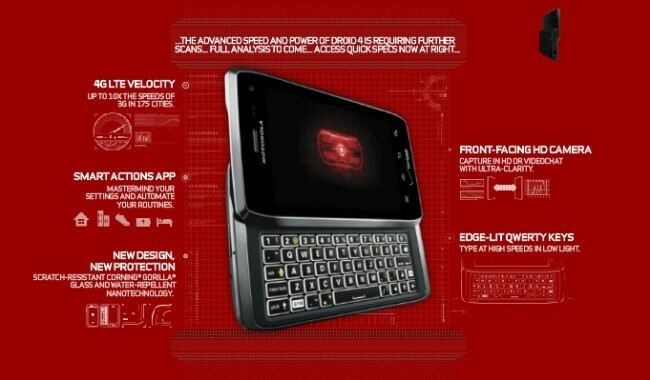 So what if the Motorola DROID 3 just launched this past July? After all, more than 5 months has elapsed since the third-gen DROID model was rolled out which means that with the way new smartphone models are produced every few months, it is time for the Motorola DROID 4. The latest speculation is that the DROID 4 will be launched on December 22nd. Just this past October, a picture of the model leaked, looking all spiffed up and ready for launch. And to confirm that the fourth-generation DROID will be here sooner than you might think, a reader for Droid-Life found the Motorola DROID 4 logo on the DroidDoes.com web site. To find the Motorola DROID 4 logo on the DroidDoes.com site, direct your browser to the site and click on the Motorola DROID 3. As you can see from the photo below, the Motorola DROID 4 logo shows up near the bottom of the page. So far though, we have not been able to replicate it on the DroidDoes site which means that someone at Motorola probably made a premature mistake that has since been corrected. 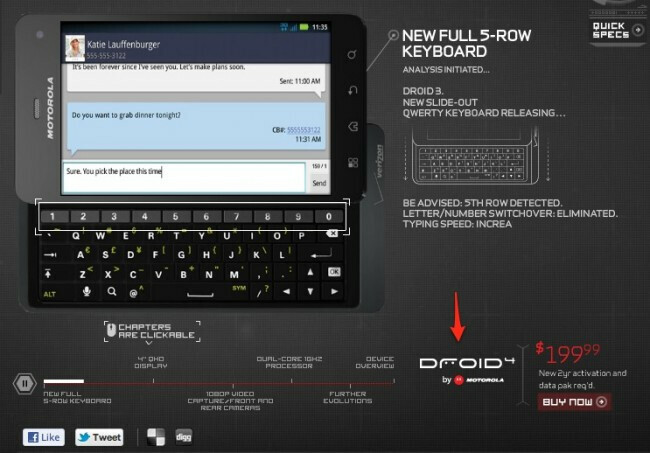 Droid Life also received a picture showing an image of the Motorola DROID 4 similar to what will probably be posted on the DroidDoes site in time. It confirms that the next DROID model will be a 4G LTE phone and will offer users the Smart Actions app that debuted on the Motorola DROID RAZR. Additionally, the device will be equipped with a display made from Gorilla Glass and like the DROID RAZR, will have the special nanotechnology coating that will make the phone resistant to light water sprays. The front-facing camera will be HD and the slideout QWERTY has edge-lit keys to allow you to type fast even in low light conditions. So the Motorola DROID 4 will soon be here, apparently, which means that Motorola and Verizon will soon dust off the ol' Droid Landing Twitter account and soon give everyone a chance at winning some DROID 4 units in a contest. It's funny, I went to a Verizon store today, they said they haven't even heard of the Droid 4... They are so full of $hit! they probably didn't. A lot of people don't read tech blogs all day and they aren't told about the coming phones until a few days before. Even if they do know they aren't really allowed to acknowledge it. They know, They are probably just told to act like they don't know. Trust me, you don't have to read tech blogs all day to know about upcoming phones. I really wish they would've released this next year with quad core and something else extraordinary. The Droid 2, 3, and possibly 4 dont have that cutting edge feeling that made the Original Droid so successful and popular. There's a reason us droid folk refer to it as the "OG Droid". How much for it without a contract? Any idea? I wonder if the folks at Moto aren't taking a page (of sorts) out of the iDevice release playbook? Churn the market with rumor after rumor. This is getting close to crazy. Just release the damn thing. Then consumers can decide whether they want to buy it or not. i'm happy with my Droid 3, after all it's lived a full life like Phone Arena mentioned but i would like to get my hands on one of these. probably what i'll do is let this get a month or two under it's belt and try to get a warranty replacement. I'm hoping as soon as this drops, the price for the d3 goes down..cause I want one. i'll sell you mine w/ 2 cases & a spare battery for $350 no contract.